May 7 is National Children's Mental Health Awareness Day, a day meant to raise awareness of the many children, youth, and young adults throughout the country facing emotional and mental challenges. This year marks the 10th anniversary of the commemorative day, and various facilities around the country will celebrate accordingly, with family activities, symposiums, lectures, youth rallies and art lessons. Yes, art lessons. Art therapy, a quickly growing field combining psychotherapy with art media, provides comfort and hope to youths facing a diverse range of challenges, from childhood neglect to the loss of a loved one. "The biggest advantage is that art can express things that are not expressible verbally," Dr. Sarah Deaver, the President of the American Art Therapy Association, explained in a previous interview with The Huffington Post. "That's a huge advantage for people who don't have the language to talk about what's inside of them." Children often fall into this category. In honor of Children's Mental Health Awareness Day, we reached out to an art therapy expert who works primarily with children and adolescents, Gretchen Miller. Miller began her career in the field as the Founder and Art Therapy Program Coordinator of a residential treatment art therapy program with partial hospitalization at The Cleveland Christian Home. She later developed and implemented a clinical art therapy program for Applewood Centers, Inc., within a residential treatment program for adolescent females. Most recently, Miller became a Certified Trauma Consultant through The National Institute for Trauma and Loss in Children (TLC). We spoke to Miller about her career path and the particulars of working with a younger set of art therapy patients. Mandala Collage (collage, chalk pastels on paper): "Working within the containment of a circle (mandala) often can be centering and provide a calm space for self-discovery. This mandala was created in an art therapy group for at risk teens to invite exploration around self-esteem. Using magazine photo collage as a material of choice can be a non-threatening approach to encourage teens to explore their feelings, thoughts, and values without anxiety about drawing skills." For starters, how do you define art therapy? I define art therapy as the psychological use of art media and the creative process, facilitated by an art therapist, to help foster self expression, create coping skills, and strengthen sense of self. Using the artistic process to help people explore different challenges and things they're facing in their life. How did you become involved with the field? I've always been involved in art, since I was a child. In high school I became interested in mental health and psychopathology. In college I started to explore more of the art therapy field. I was very fortunate to go to a school that had an art therapy degree in undergrad. Combining my love of the practice of art and psychology, and getting to help people in need, it was a perfect fit for me. After that I got a graduate degree in art therapy. 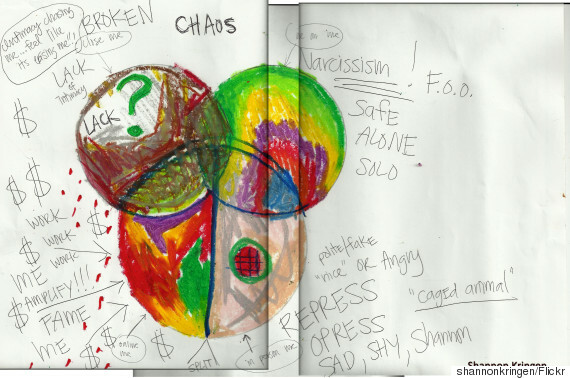 Safe House Image (crayons and markers on paper): "Re-establishing safety is an essential component to working with youth who have experienced trauma and loss. 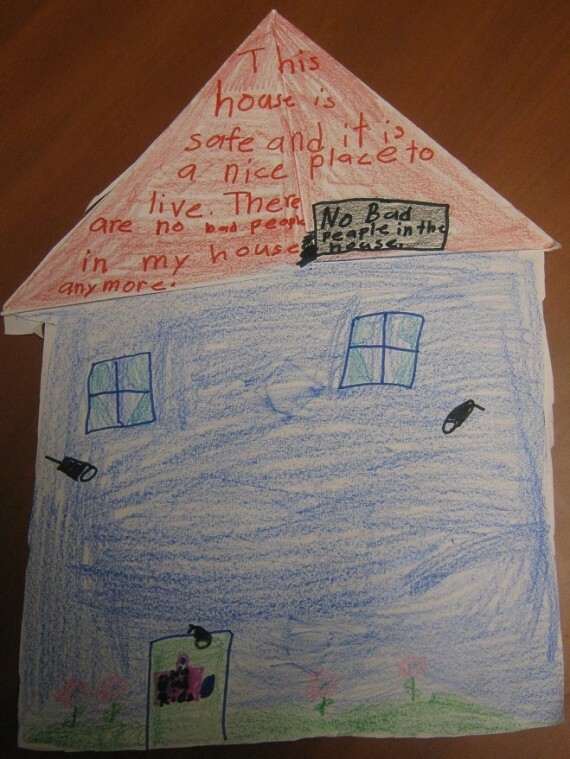 Creating spaces and places where a child feels safe or to depicts what safety looks like to him/her not only helps foster protection and security through the art, but allows for empowerment and a sense of control over this environment. This drawing was created in response to exploring what it means to have a safe home with a child who had been exposed to family violence." How did you get started working with children? I had some experience as an undergrad doing volunteer placements with youths. I had envisioned myself back then working more with adults, but my real first job was in a residential treatment program serving boys ages six to 16, and at that time, I just wanted experience with people. Did you end up enjoying the experience? I enjoy working with adolescents a lot. They're a challenge. They definitely keep me on my toes in that age range. It's just a natural expression for kids to use art. That creativity is very freeing and the imagination is so open at that age. It lends itself so well to the therapeutic process and making art. I love their energy and the inspiration that they bring. 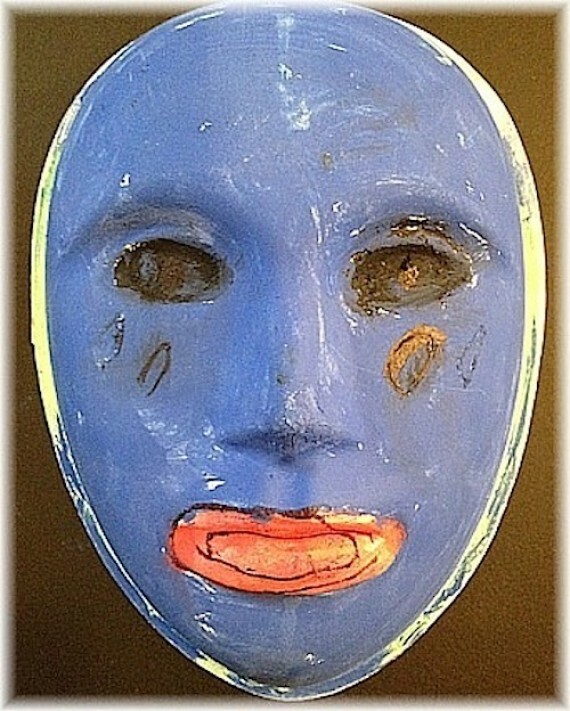 Mask (acrylic paint and markers on paper pulp mask): "Mask making can offer a powerful way to safely externalize emotional states that a child is experiencing. In response to exploring a feeling that sometimes remains bottled up inside; painting or creating a mask can reveal and identify many feelings difficult to describe in words." What kinds of challenges are the children you're working with facing? In the past I've worked with children that were in the foster care system or had a lot of behavioral and emotional needs that stemmed from early childhood abandonment or neglect. A lot of times their parents weren't able to take care of them. I then became motivated to focus more on trauma in my work. From there I started to work with children who had been impacted by domestic violence or who have experienced a loss or death of a loved one, whether through illness or suicide or homicide or accident. Working with those two populations really taught me a lot about how art can be used to heal wounds. Currently I work in a shelter with women and children experiencing homelessness, many of whom are trying to transition out of homelessness and some of whom are vulnerable to human trafficking. We help them strengthen themselves, make themselves less susceptible. 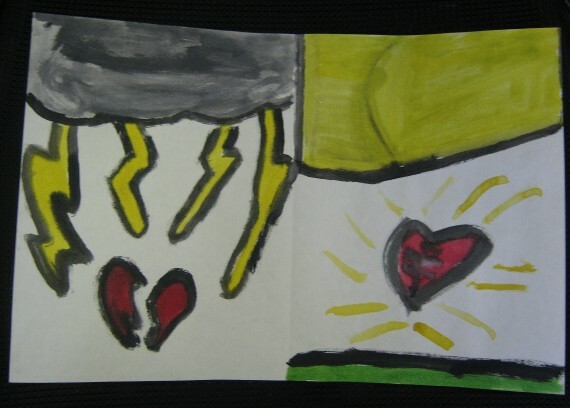 Heart Image (tempera paint on paper): "This painting was inspired by exploring feelings through depicting them as a kind of landscape in nature or weather." What does an art therapy session with you look like? I do a lot of group art therapy. I feel the group work really gives the kids a sense that they're not alone. They're not the only kids who are experiencing these reactions or these responses to the painful things that happened to them. A lot of the job is planning which activities would be most helpful at approaching certain problems. What activities have you found to be most beneficial? I like to focus on interventions that will provide safety or reestablish safety for the user. That's really important after traumatic experiences. That sometimes leads to working with spaces of containment, symbolically, or through the metaphor of art. Also, looking at their own physical responses, their bodies' reactions to trauma or whatever difficulties they are experiencing. Maybe they have stomach aches or headaches or trouble breathing. Using the art to help show that, so they can be more connected to how their bodies are responding, and then explore ways of coping through the art to help with those responses. So art that focuses on self-regulation or soothing or relaxation, through painting or drawing, mask making or things like that. Also using art intervention themes that focus on things like sadness, pain, worry, fear, anger. With these kinds of threatening feelings, it's often easier to explore them through art, than to talk about them verbally. 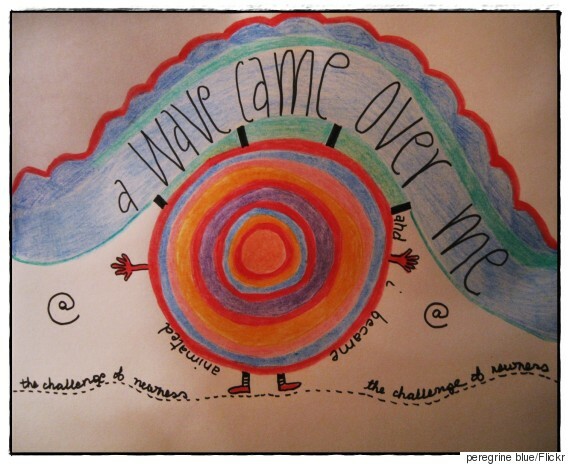 What advantages, in your opinion, does art therapy provide children over other types of counseling or treatment? Art making is a natural expression for children. They're very open and ready to engage with it. It really helps build that sense of self and emotional expression. Giving them that at a young age, hopefully while they're still in childhood, will hopefully help them be stronger as they move through adolescence and into adulthood, and be more able to develop those coping skills. There's that innate, imaginative ability that's not so censored in them yet. Adults often say, "I can't draw," which isn't important -- art therapy is about the process, not the product -- but it's nice to work with kids who don't have that anxiety. What kind of progress have you witnessed in your time working with children? Occasionally I've seen people I used to work with as adults, still in difficult situations and trying to find their way. I've definitely seen the process come full circle. Changes can also be seen within the art that a feeling -- such as worry, anger, or sadness -- is not as consuming as it was depicted before, or the child's sense of self and their ability to cope has strengthened. Art therapy can be a helpful intervention for stabilizing overwhelming emotional states and crisis situations because of the safe containment it provides. Can you talk a little about the meaning and importance of Children's Mental Health Day? This year is actually the 10th anniversary, so Children's Mental Health Day has been going on for a while. I think it's very helpful to have a day spotlighting children's mental health. It fosters a sense of hope for recovery and builds resilience for these issues. It also raises awareness to help with prevention and early intervention, helping children to be less at risk for mental health issues. The day also helps to take away the stigma attached to mental illness, getting that out of there early on and getting children more aware of the mental health needs that they may have.